Still on a linen kick! In case you missed Wednesday’s post talking about my short suit obsession, linen is one of my favorite fabrics for summertime. It’s so breezy, casual and effortless, don’t you think? 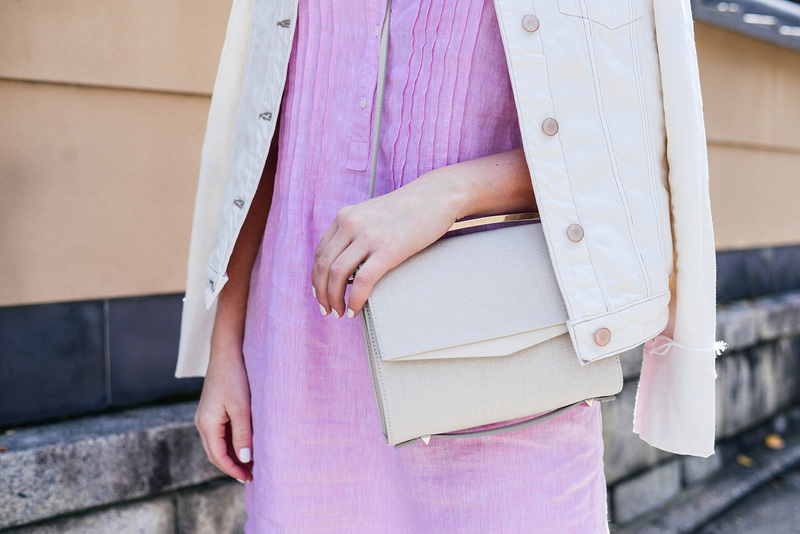 If you recognize this linen dress, it’s probably because I already own it in white! It’s such a great everyday staple – the longer hem makes it appropriate for all kinds of things, and it can easily be belted for more of a fitted look. Since we’d already been eating a bunch on this trip, I decided to opt out of the belted look for this day walking around Kyoto. We walked around Gion, re-visited Nishiki Market for lunch and sauntered down Philosopher’s Path (stopping for wine, naturally) before heading back to the AirBnB to freshen up before dinner. We’d figured out by this time that spring in Japan means chilly mornings, pretty hot afternoons and back to cool evenings. That’s why I paired my linen dress with this ecru denim jacket – it was the perfect outfit for a day of exploring! For reference, I’m wearing an XS in the dress. Don’t miss these other gems from J.McLaughlin’s current collection – so many comfortable classics and a few fab pops of color! If you love stripes, don’t miss this sleeveless shift, this jumpsuit (looks SO comfy!) and this everyday tee. Looking for a cute daytime bag for summer? This little wicker tote is everything. Also love this bucket bag with the optional shoulder/crossbody strap. In addition to my linen dress, I also picked up this cozy cashmere wrap in Salmon/Coral. Such gorgeous colors!! This printed kaftan would be such a fun coverup this summer! Y’all know how much I love swiss dots right? This top is definitely on my list! This flattering wrap dress comes in the prettiest print! Obsessed. Great Spring look and love that little bag. I love a good linen dress! This color is so pretty! I love the arctic color, it’s such a great alternative to blue. That wicker bag is great, J.Mcglaughin does straw bags so well, every time I open the site I want all of them!